The P2D2 (Predicted Powder Diffraction Database) is built up by calculating the powder patterns corresponding to the predicted crystal structures from the latest PCOD update . The job is done partly by ZEFSA II (898.707 entries) and for the GRINSP data (163.520 entries) by the CIF2POW software  able to read a large multiple CIF and to provide the corresponding powder patterns in a format described below. Ref: A. Le Bail, J. Appl. Cryst. 38 (2005) 389-395.
violating the existence conditions of the "probable"
ZEFSA II (Michael W. Deem and David J. Earl) : 898.707 SiO2 zeolites entries selected according to energy criteria (GULP calculations) among a largest dataset of ~2.7M entries. GRINSP (Armel Le Bail) [3-4]: 163.520 entries, lists of formulations are available corresponding to the 2009 PCOD update, together with classifications according to the framework density (...-FD.txt files), the quality R-factor (...-R.txt files) the complete lists of connectivity sequences (CS) (...-con.txt files) and the multiple CIF corresponding to each series. GRINSP produces N- or N-N'-connected 3D frameworks. The values explored for N-N' are 3, 4, 5, 6, corresponding to polyhedra such as triangles, tetrahedra, pentahedra and octahedra connected exclusively by corners, forming either binary or ternary compounds [5-7]. 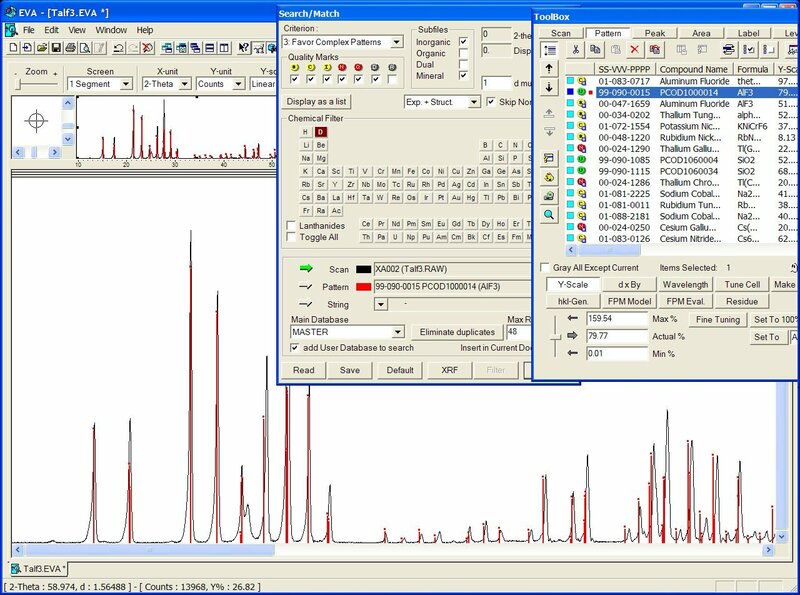 The main purpose of the P2D2 is to allow for identification of unknown compounds which would even not be recognized by a search-match  through the powder diffraction file (ICDD - PDF) (containing essentially the powder data for known compounds). The P2D2 cannot be used directly with any search-match software, up to know. There is the need to compile the P2D2 in order to prepare the proprietary files as required by the various search-match computer programs (EVA-Bruker, Jade, Match from Crystal Impact, Highscore from PANalytical, etc). Up to now, the P2D2 was compiled to be used with the EVA search-match software (Bruker) and Highscore (PANalytical). In case of a successful identification, you will obtain the CIF filenumber in PCOD (see the figure below sith the file PCOD1000014). Then go to the PCOD database in order to obtain the CIF (use 1000014 or PCOD1000014 in the text search box). Note also that realizing the search-match in your powder pattern 2-theta range < 40 or 30° will increase your chances of success with the P2D2, because the peak position at low diffraction angle is less sensitive to large cell parameter discrepancies (this is clear on the figure below). The knowledge of your zeropoint is also essential. The >1.000.000 entries in the PCOD are delivered in full open access under the CIF format. The CIFs from ZEFSA-II have names between 8000001.cif and 8313568.cif for SLC-refined models and 9000001 to 9585139 for the BKS-refined models. The CIFs from GRINSP have N******.cif names with N different from 8. The P2D2 (~1.000.000 powder patterns) may also be delivered as a text file for compilation purposes for other search-match software on demand. If your usual search-match program does not give access to the P2D2, ask to your search-match software provider. GRINSP data : part 1 (zeolites and frameworks with one sort of polyhedra, ~60.000 entries), part 2 (structure candidates combining two kinds of polyhedra, titanosilicates, etc, ~100.000 entries). This limitation does not occur with data from ICSD included in EVA because the compilation process is different (Master Database - not User Database). So, unfortunately, to check your experimental data, you need to repeat 11 times the job by the selection of these 11 "user databases", one after the other. See how this is realized with EVA. If you are interested in the addition of particular families of compounds, isostructural with other families already inside of the PCOD, the structures may be built on demand by the GRINSP software - if possible (N- or N-N' connected 3D nets). More development of the GRINSP software is intended in order to allow for other connectivities than by corner-sharing (edge, face, mixed). Hole location, filling them with appropriate ions in order to ensure electrical neutrality. Using of the valence bond theory. Etc. A question is to keep or not several descriptions of the same structure in different space groups and cells, as they may appear during the ZEFSA II / GRINSP predictions. In PCOD, the choice was made to keep only one model corresponding to a given connectivity sequence, selected for its highest symmetry and best R factor (so that each zeolite model is unique, etc). A. Le Bail. PCOD : The Predicted Crystallography Open Database. A. Le Bail. PPP - Powder Pattern Prediction, IUCr Commission on Powder Diffraction Newsletter 31 (2004) 51-53. A. Le Bail. Geometrically restrained inorganic structure prediction : GRINSP, IUCr Computing Commission Newsletter 4 (2004) 37-45. A. Le Bail. Inorganic structure prediction: too much and not enough, Solid State Phenomenon, 130 (2007) 1-6. A. Le Bail. Predicted corner-sharing titanium silicates, Z. Kristallogr., suppl. 26 (2007) 203-208. J-M. Le Meins, L.M.D. Cranswick and A. Le Bail. Results and conclusions of the internet based Search/Match Round Robin 2002, Powder Diffraction, 18 (2003) 106-113. A. Le Bail, Frontiers between crystal structure prediction and determination by powder diffractometry, Powder Diffraction, Suppl. 23(2) (2008) S5-S12. (PDF).